Considered by many to be the father of the modern day “land ethic” in the United States, Aldo Leopold wrote of the importance of “thinking like a mountain”. In response to witnessing “a fierce green fire” in the eyes of a dying wolf, he considered the long-term impacts of losing a species. 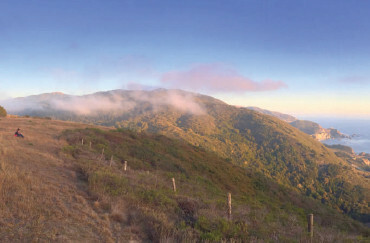 The idea of “thinking like a mountain” also captured the interconnectedness of nature, environmental sustainability and the importance of maintaining the long view. heights, to cultivate patience and to redefine what conservation can mean for everyone. As supporters of Big Sur Land Trust, you are part of an unfolding conservation legacy; a story that takes the long view and deepens with each acre conserved, each tree planted, each trail built, and each person that gets involved. Thank you for making local land conservation a community priority. And to Zad: Thank you for thinking like a mountain.